A team of students mentored by assistant professor of marketing Gema Vinulaes participated in the annual Google Online Marketing Challenge earlier this year and the results are in. The annual competition is open to undergraduate and graduate students from all disciplines. Each team of three to six members is given a $250 Google AdWords budget to run an online advertising campaign for a three-week period. Campaigns are judged based on statistics, structure and implementation. While the TU team did not win, the students outperformed 73% of the 2,129 teams competing worldwide. Not bad! EBTM students also recently participated in a regional competition related to data and analytics. 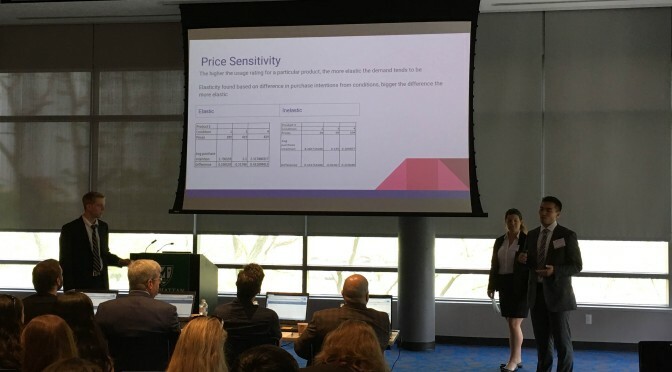 A team represented Towson University at the Manhattan College Business Analytics Competition in New York City in May. Thanks to Natalie Scala and Toby Porterfield for mentoring and supporting the team!